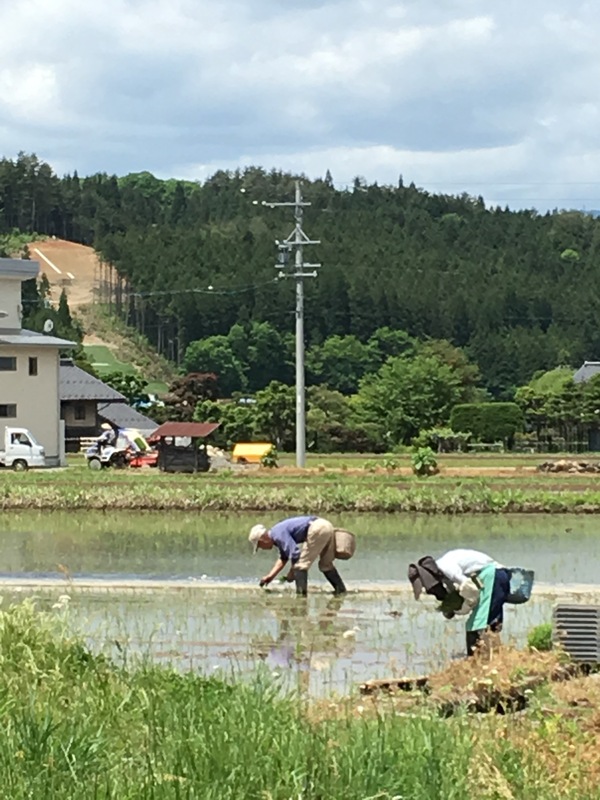 Not being from the countryside, let alone Japan, I’ve asked myself the question: How are all these beautiful rice fields prepared, planted, cultivated, harvested? I’ve heard the same question from friends and family as well. 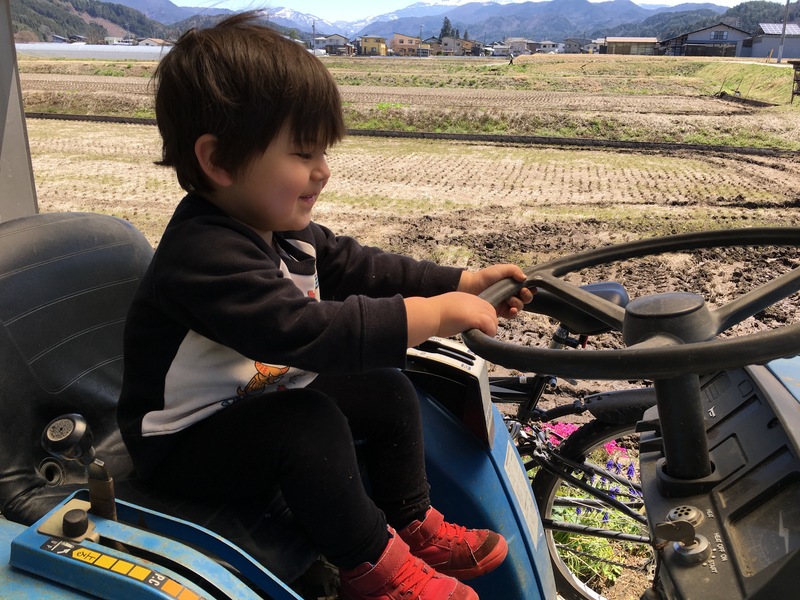 Fortunately, this year I got to see the process take place over a couple months as the one behind our house was turned from a dry, already-harvested field – into a fresh newly-planted one. 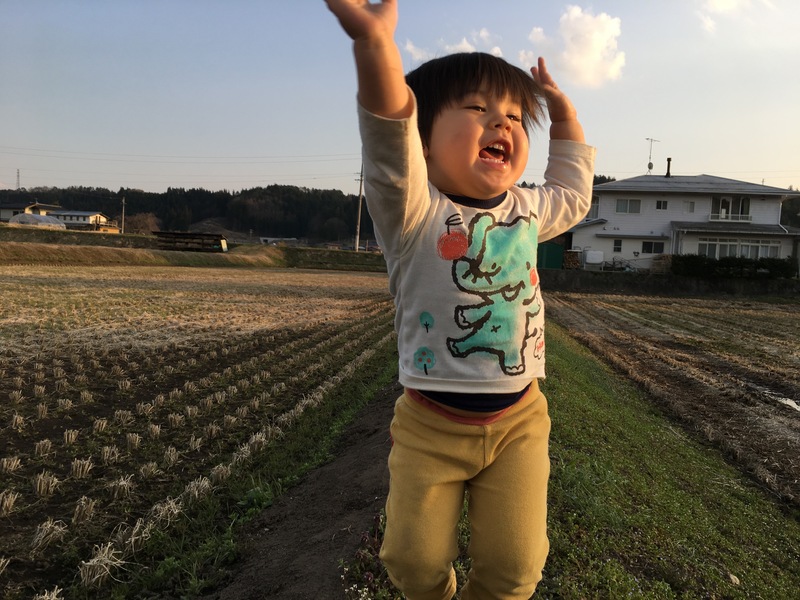 By the time we arrived in March, winter was fading away along with the snow, and most rice fields sat empty with dry stubs where the rice had been harvested last year. But as spring would start to appear, I would see these fields being prepared for growing in the new year. This starts out as you probably might expect. A tractor tills the dirt with large rotating blades, turning the soil over and chopping up any plant material. Next the sides of the field are shaped up, corners rounded, and sometimes covered with plastic to help “keep water in” later on. Next the fields are flooded. How? Well.. up here in the mountains, water runs everywhere, a constantly supply from the snowy mountain tops and several rivers in the area, so everyone has plenty of water to irrigate their fields naturally. 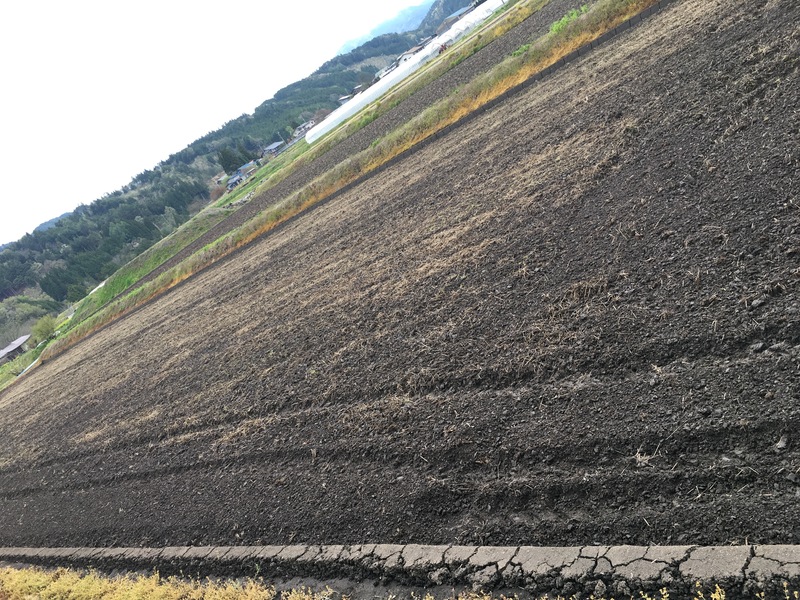 Next, the fields are tilled once again…. maybe 3 or more times, getting the soil into a nice fine, smooth texture. I often see people adding fertilizer pellets at this point either walking the field and throwing it by hand, or via a machine (backpack with a pellet shooting attachment hose). When everyone irrigates their fields around the same time, it’s a beautiful scene to behold. After some time and continued irrigation it’s time for planting the Nae (苗) or baby rice plants. It seems like most people purchase these by the crate from a nearby grower. And next comes the fun part. The crates are loaded into a small tractor type vehicle which is exclusively for planting the little seedlings into the ground. It is quite satisfying to watch. Do people still do it by hand as well? Absolutely. I saw several old farmers doing it the manual way, though I have to imagine it adds many hours to the equation. From here the water stays with the seedlings for a good, long time. As the rice grows, the water subsides, and more is added… it’s safe to say the soil must always stay moist, if not flooded with water. with a traditional grass roof house in the distance. And there you have it. From a visual overview, this is what it looks like. Curious about harvest time? Check out my blog post entitled.. “A Rice Field is Harvested“.